What is Custom Business Software Development Solution? A software solution that is specifically developed for a given use case is called Custom Business Software Solution. As the application is developed a specific organization or a user, the features and functionalities of the application are very precise. For example, if a custom application is developed for an e-commerce website, every attribute of the application can be developed based upon the final expected outcome - a custom cart, a custom carousel, custom categories of products, custom product details, custom delivery options etc can be developed based upon requirement. Using a Custom Business application improves the user experience. It improves the ease of developing and maintenance. Every minute factor of desire can be integrated into the application. However as every feature can be developed with subtle care, the investment required for Custom Business Software development is high. Why to build Custom Business Software Solution? Suppose that there are two firms. The first firm A is a pizza service firm and the second firm B is a furniture supplying firm. The software application that is used for maintaining the records of firm A is different than that of the firm B. This process of developing a “custom” software application for both the firms A and B is called Custom Business Software Development Solution. In contrast with Custom Business Software we have Generic Business Software, which is developed in such a way that it can be used irrespective of the business, with minor changes or no changes at all. For example, there are two pizza service firms C and D. The software to maintain records for both the firms C and D is almost similar to each other, which is a Generic Business Software. The major advantage of Custom Business Software over a Generic Business Software is that it is tailor-made for a given use case. In the example, the business attributes of firm A are completely different from that of the firm B and hence a common software cannot serve the purpose. Every software is developed through a series of development phases. They are Requirement Analysis, Design and Layout, Code Implementation and Testing. Requirement Analysis is the process of determining the constraints to meet the specifications of the product. Requirement Analysis plays a major role in the success or failure of a project, as it is the foundation of the project towards building an effective and perfect solution. Requirement analysis involves in three steps - Gathering the requirements, Analyzing the requirements and Recording the requirements. Software Design and Layout involves in defining the software solutions and the approach to achieve the solution with the resources available. If constructing a building is compared to software development, then design and layout holds the purpose in both the case. In simple words to say, design and layout plays the role of black box of the project. As software development is the context, with the design that is developed from the previous phase as reference, software is developed. Once the entire design and layout has been developed, it has to be implemented. A respective piece of code has to be developed that suffices the goal of the project. Let us consider an e-commerce software for example. A code has to be developed for different modules like categories of products, sorting the products, discounts on the products, coupon codes, cart features and the list goes on. Merely developing a software is not sufficient for a software to perform well during the time of usage. It is to be thoroughly tested in order to achieve the goal of the project efficiently. In an e-commerce software, if a piece of code behaves in such a way that it adds an extra zero at the end of the total price, then a customer refrains from using such software. This ultimately results in all the development effort vain. So, every software developed and every single line of code developed has to be tested, verified and validated thoroughly in order to achieve the goal of the project. Suppose that the e-commerce application developed with the help of previous steps is not working as per the specifications in real-time, though is has been tested and verified. The reason for this failure may be due to some hardware requirement mismatch at the user end, regional restrictions or some reason. As a developer, the software that we developed should be maintained, at least by a third party. This completes the cycle of a software product. The life cycle of development of a software may vary from developer to developer or from software to software. The four phases of custom business software development life cycle mentioned here are very generic. Based upon the requirements and specifications, several other phases can also be integrated or the existing ones may be disintegrated. How Custom Business Software Solution is Developed? There are different approaches in developing a custom software solution. The most commonly used approaches are Scrum, Waterfall, Rapid Application Development and Agile methodologies. These methodologies define how a particular solution or an end software product can be developed based upon the type of specifications of the project. When there is a need to improve productivity among the members of a team, then Scrum is the best software development methodology. Scrum methodology involves in creating teams that can work by themselves i.e., self-organizing teams. Brief meetings are conducted everyday in order to updated the status of the project, analyze the current requirements and to organize obstacles of the project among the team members. Waterfall software development methodology is the most traditional methodology of software development. 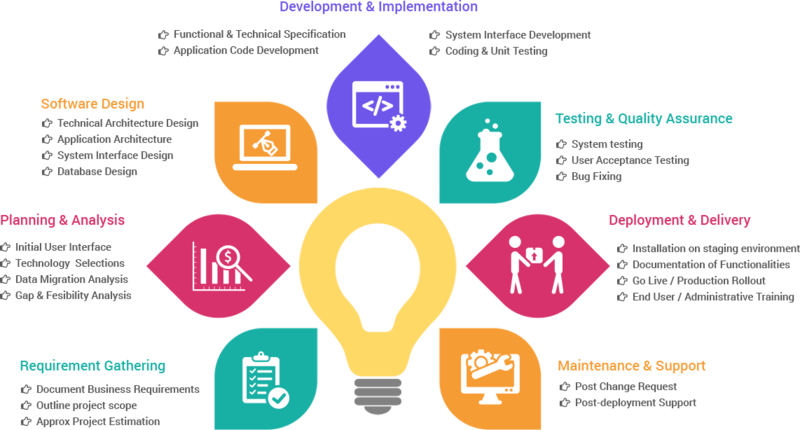 It is a linear methodology with five phases of software development - Requirements, Design, Implementation, Verification and Maintenance. When speaking about the Software Development Life Cycle (SDLC), Waterfall methodology is the reference for all the methodologies. The use case of Waterfall methodology is when there is a clear documentation of requirements and specifications of the end product. However, the drawback of this methodology is that it is time consuming and a costly affair. When the budget of the project is limited or the requirements of the project are dynamic, then Rapid Application Development Methodology (RADM) is the best way to complete the project within the stipulated time. RADM is generally implemented in the projects with short period of development. There are four phases that are followed in RADM - Requirements planning, User Design, Construction of prototype and Cutover. Though RADM serves the purpose short term for project development, it demands highly skilled developers in order to achieve the targets. In Agile methodology, all the tasks of the project are divided into subtasks called “Iterations” and are executed to achieve a comprehensive goal. An iteration usually lasts up to four weeks. The Agile methodology considers the working software as a parameter to measure the progress of the end product. The major aim of implementation of Agile methodology is to minimize or sometimes eradicate the probability of errors when new features are integrated into the project. There are other methodologies implemented for custom software development. However, the four methodologies mentioned here are the most commonly implemented ones in the IT sector. For the existence of software, there is a need to develop custom software. Custom software applications can be developed in different fields of daily life. Consider that you have a hard drive with numerously large number of files, with random names, and you want to rename all of those files based upon a serial number. This requirement is not very common, in order to find a generic application for renaming. However, when there is a requirement of such task, custom desktop software provides a solution. An application that solves the current problem of renaming can be developed. As a developer, if you find that the renaming problem persists across the market then you can release your own version of the custom software. Based upon the area of application, there are different kinds of desktop applications - Application suites (MS Office, Libre Office etc), Enterprise software (Skype, Messengers etc), Educational software (Wolfram player, Simulation software etc), Multimedia software (VLC media player, Photoshop etc), Content Access software (Browsers, Putty etc) and Information or Utility software (Z CPU, Recuva etc). Just like desktop applications, custom mobile applications can also be developed, as the usage of mobile devices is increasing exponentially everyday. For example, sending personal messages was a huge task a decade back. Then, it was a custom requirement that people wanted to have private conversations. As it has gained popularity among the people, custom mobile applications like WhatsApp and Messenger were developed. Android and iOS are the two major mobile operating systems available today. Each of the application stores of these mobile operating system are being updated with several custom mobile applications. Artificial Intelligence (AI) is another technology that has potential need for custom application development. It is to be understood that AI is usually implemented on the data collected from different users, where the end application or usage of this data will also be very random and ambiguous. Hence, only a custom application software can serve the purpose of efficiently using the data collected, in order to attain a collective target. Natural Language Processing (NLP), Speech recognition, Image and facial recognition, Virtual agents, Robotic process automation, Biometrics, Deep Learning and Machine Learning are the major technologies that involve in Artificial Intelligence custom application development. As the internet has become very common in every human being’s life, so is computer security. A study states that the computer security a decade back is 100 times vulnerable, due to the rapid development of technology. Either for Whitehat purposes or for defense mechanisms, custom application development is required. It is very famously said that expert ethical hackers do not use application software available in the market rather they develop their own custom application software. It tailor-fits the use case of the application. Integration and disintegration of different features of the software is easy. Efficiency is high when compared to that of a generic application software. Optimized for a specific use case that is stated in the software requirements. It’s a costly affair as it cannot be used in other use cases. Time consuming as fine detail of the software is required. Expertise is needed for developing a project. Support and documentation is tough. Competency in the market is comparatively less, unless the use case of the application previals. Resource Management Software (RMS) is used to take care of planning of the resources for a given organization. In order to maintain the details of the resources for developing a project, an organization needs an RMS. Resource planning, Resource availability forecast, Resource discovery, Resource audit, Resource scheduling are the most common features of an RMS. It all depends upon the organization’s hierarchy to choose which RMS to use, where Mavenlink, Wrike, Resource Guru, Saviom ERM, Workfront and Project Insight are the most commonly used RMS. For any organization, the remuneration of the employee is either decided or incremented based upon the performance of the employee. But, the question is about the tool that measures the performance of an employee. A Performance Management Software (PMS) helps to achieve the purpose. A PMS eases the task of evaluating and rating the performance of any employee based on the custom parameters of an organization. Keka, HR-One, Qandle, PossibleWorks and Zoho People are the some of the most commonly used PMS in the industry. For any project for its successful delivery is to be managed efficiently. A Project Management Software is one such software that can efficiently handle different parameters related to a project like Requirements and Specifications, Design and layout of the project, Implementation methodology, milestones of the project, discussions related to the project, contribution of individual team member for the project etc. Trello, Microsoft Project, Jira, Primavera, Zoho Office Suite are the some of the best examples of Project Management Software. A software that helps manage the increasing employees of an organization is called Human Resource Management Software (HRMS). It allows tracking of an employee and helps to ease the process of payroll. There are different types of HRMS - Payroll Software (PS), Human Resource Information Systems (HRIS), Applicant Tracking Systems (ATS) and Human Capital Management Systems(HCMS). For any given website, the content is the key aspect. In order to manage the content of a website, a Content Management Software (CMS) is used. It helps in placing the content in the website in the desired fashion. Wordpress, Joomla, Magento, Blogger, Umbraco, django CMS are the most commonly used CMS. However, there are different CMS based upon the niche to which the website belongs to. Business Intelligence Software (BIS) is a special type of software that helps converting raw information into data insights. For example, an BIS for an e-commerce website can analyze and produce fine results like sales for individual categories, locations with highest number of deliveries, locations with highest number of order initiation, best mode of reaching the customers etc. There are different types of BIS - Data Management BIS, Data Discover BIS and BIS Reporting Platform. Enterprise Resource Planning Software (ERPS) is defined as the software that allows an organization to automate management and administrative tasks related to technology, service and other human resources. SAP ERP, Odoo, Microsoft Dynamics, SAP Business One and Microsoft Dynamics GP are the most commonly used ERPS in the market. The software that allows an organization to manage the way it provides services like order management in the organization, hardware and software management, maintenance of the project, and diagnostics and troubleshooting to the customers is called Service Management Software (SMS) or sometimes IT Service Management Software. The collection of data stored in a computer, which can be accessed as needed is called Database. The software that allows an organization manage the database is called Database Management System (DBMS). dBase, MySQL, Microsoft Access, PostgreSQL, Oracle Database and Microsoft SQL Server are the most commonly used DBMS in the market. A software that allows management of knowledge is called Knowledge Management Software (KMS). A KMS provides a platform to create, manage and redistribute knowledge. For any given project, there are certain knowledge to be accumulated before getting into the project, like requirements and specifications, prerequisites documents, hardware or software specifications etc. Bitrix24, Zoho Desk, ProProfs Knowledge Base, Atlassian Confluence and ServiceNow Knowledge Management are the top KMS available in the market. Every organization suffers failure in internal systems. The software that is capable of handing the internal system failures of an organization is called Operational Risk Management Software (ORMS). There are various ORMS available in the market like Blueprint Oneworld, ADAudit Plus, Corporator Business Management Platform, Diligent Boards, Optial SmartStart etc. As the name is self explanatory, Accounts Management Software (AMS) deals with managing the accounts of an organization. In simple words to say, the AMS used within an organization decides the financial efficiency of an organization. There are many AMS available in the market and an organization has to choose an AMS such that the accounting system of the organization is reinforced. Every organization has assets - be it computers, laptops, hardware, infrastructure - everything that exists physically in regard with the organization. As it is highly impossible to manage all these assets manually, Asset Management Software (AMS) was developed to serve the purpose. Custom Business Software Solutions are being used in wide range of industries. As long as software is involved, there is a need of custom business software. Following are some of the most common industries that use Custom Business Software Solutions. Automotive - For managing the cluster displays and automated controls. Banking and Financial services - For providing bank-specific financial services. e-Commerce - For providing innovative shopping experiences. e-Learning - For the visualization and explanation various subject matters. HealthCare - For diagnosing specific cases to provide efficient treatment. Media and Entertainment - For providing enhanced audio experience. And the list goes on. As mentioned earlier, software and custom software are not separable. Though there is a need of generic business software, custom business software is equally potential in enhancing the business.